Vandalia was laid down in 1825 at the Philadelphia Navy Yard and launched in 1828. 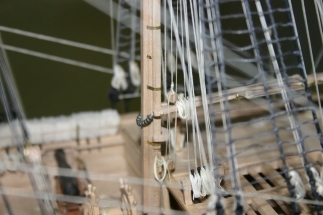 After the war of 1812, the Naval Board recognized the need for additional sloops of war. The war had demonstrated their usefulness, the nation was expanding into the Pacific and needed to project naval power there. The Board also wished to take advantage of the advances in gunnery, specifically the 24 pound long gun. Perhaps the loss of the Essex was still on their mind; but certainly, the intent was to arm the new sloops with long guns for their role as commerce raiders. The desire for smaller ships with shallower draft plus the desire for larger, and heavier, guns would prove to be an unfortunate combination. 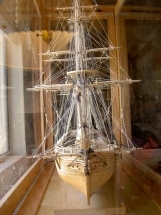 The design of this class of sloops (Boston class) was largely derived from a design by Samuel Humphreys, but was “improved” by a committee of the Naval Board. 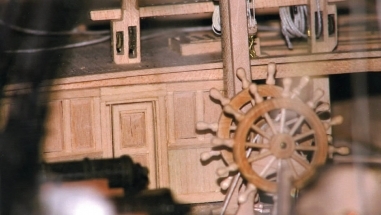 The final approved design included some modifications including a round stern instead of the original transom design. 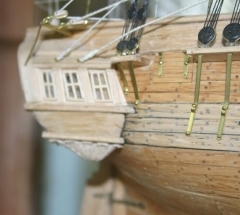 This would have been a significant improvement, but not all ships were constructed the same, as described below. The Board decided that the ships should be built at each of the regional shipyards in the US at the time. 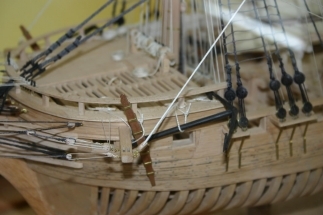 This geographic distribution introduced some variation in construction of the ships, as did also the practice at the time of allowing the designated commander of the vessel to request changes in the plan during construction. 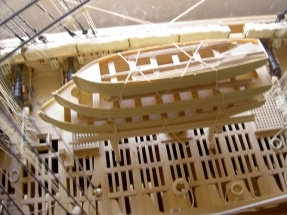 The original plan called for 24 gun ports plus bridle ports and gun ports in the round stern, but this was modified among the various ships built to the plan, as the builders at the six yards where the ships were built altered the plans. 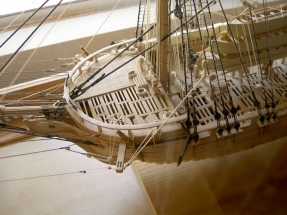 The Vandalia, in particular, had a compromise of a stern, which might be termed “half round”, with the cant frames extending further ‘round, but still having a transom, albeit narrower than the traditional transom. The addition of quarter galleries further camouflaged her design. 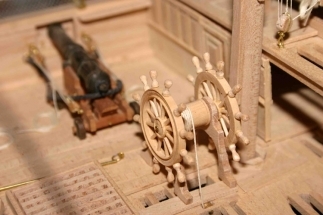 These changes were attributed to requests from the commander, but most of the ships in the class ended up with false quarter galleries, a nod to tradition. The ships were, in general, less than successful. 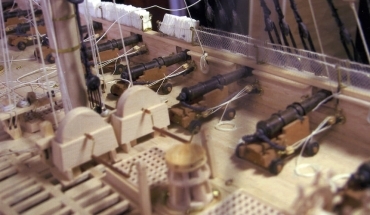 One problem was the insistence that they carry 24 guns in a hull better suited for 18 – 20 guns. 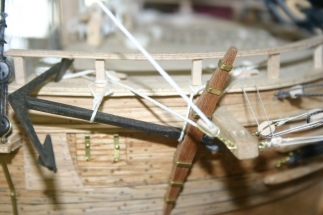 Also, the hulls were somewhat barrel-shaped with full bows and stern, so, with the additional weight of the additional heavier guns, they floated low and lacked the agility expected of a sloop. Vandalia served in the Brazil squadron (1828-31) and after major repairs (1832 – 34) in the West Indies Squadron (1835-38). She was decommissioned 1839 – 41, returning to duty with the Home Squadron 1842-45. While laid up, in 1847, she was lengthened by 13 feet (in the middle of the hull) and rearmed with 4 x 8” shell guns and 16 x 32-pounder carronades. She joined the Pacific Squadron in 1849, serving until 1852. In 1853, she joined Commodore Perry’s East Indies Squadron, and was present at Perry’s entrance into Tokyo Bay in 1854. Briefly decommissioned in 1856, she returned to the Pacific Squadron in 1857. In 1859, she rescued survivors of the wrecked American clipper “Wild Wave”. In 1861, with the start of the Civil War, she was recalled home and assigned to the South Atlantic Blockading Squadron, serving in the Charleston area. She captured the schooner “Henry Middleton” and assisted in the capture of the ship “Thomas Watson” that same year. She supported the amphibious assault on Roanoke Island and resumed blockade duty through the end of 1862. Early in 1863, she was decommissioned and spend her last days in Portsmouth, NH, as a receiving and guard ship until broken up sometime between 1870 and 1870. 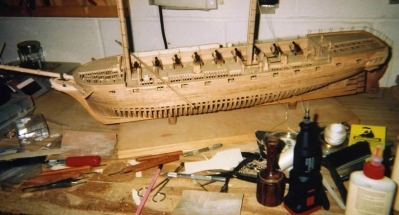 The model of the Vandalia was entirely scratch built from plans in the National Archives, using maple for frames, timbering, masts, spars, and deck planking, with red oak for hull planking. 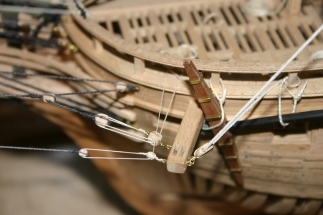 The model hull planking was fastened with wooden pegs. 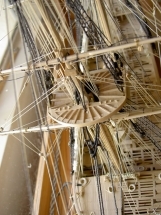 The National Archives plans were for the hull only, as was the practice at the time, so the masting and rigging re-construction was conjectural, based on practices of the time. 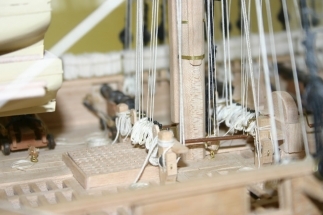 Because of the “half round” stern and the quarter galleries, supposedly requested during construction by her first commander, certain rigging was done is in older ways than might have been the most current or up to date practice of the time of her launch. I thought that perhaps a commander who was somewhat anachronistic might have a sailing master of similar persuasion. 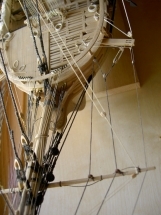 The cordage is cotton, made up from various thread using a home made rope machine. 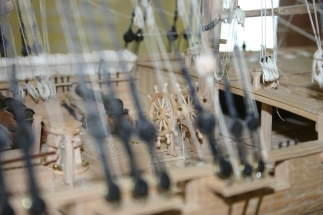 For the most part, ropes that would be cable laid or rope laid are such on the model. 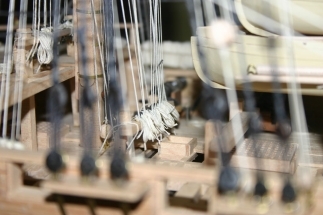 No commercial fittings, other than belaying pins, were used in the model. The model is in a heavy custom made oak case with acrylic glazing and LED lights. External dimensions of the case are: 50.5″ wide x 39″ high x 18.5″ deep.